Here are a few pics of the barn. I am not sure what information you lost on it but I will tell you as much as I know. 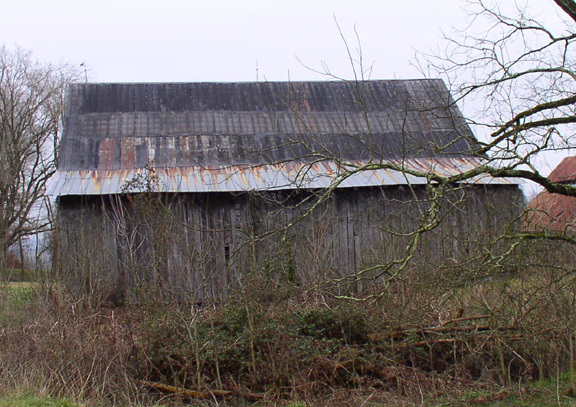 The barn is located on Lone Mountain Road about an 1/8 of a mile from the entrance to Lone Mountain Shores. It was constructed from chestnut lumber. It is believed to have been built when Dr. Samuel Atkins owned the property. The original structure was 40'x60'x25' tall. There have been additional sheds built on either side that brings the final demensions to 70'x60'x25' tall. That is about all I know about it. 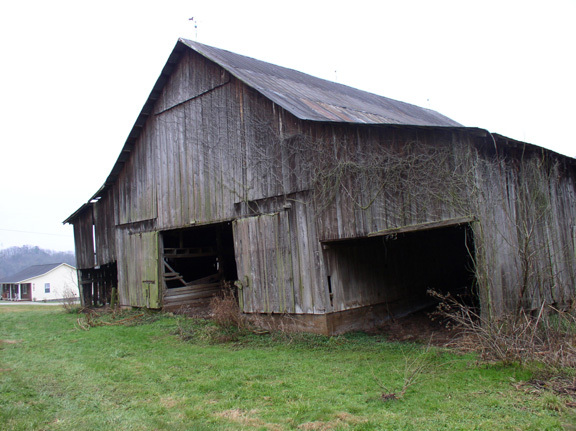 If by chance you can help with the history of this barn please contact Joe Moore. The barn is coming along nicely. I have finally gotten it leveled back up and removed the mountains of manure. I am going to start putting it back together in the upcoming week. I would like to put it back the way it was but since I don't have a clue as to what that was, I am going to put it back as close as I can from what I have gathered from the looks of other similar barns that weren't quite as abused as this one. I have no problem with you putting pictures or links to me on your website. I have two addresses as you will notice when you get this email. You can use the moore4808@bellsouth.com for simplicity as I can receive mail from it at either location. Anymore information that you can muster up will be greatly appreciated.